WELCOME My name is Will Boyett. Back in 1981, Motley Crue had two official photographers. I was honored to be one of them. The photos of the early shows have been sitting in my vault, never seeing the light of day. Until now. 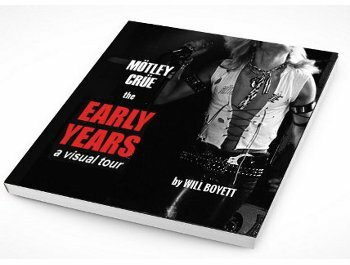 I’m releasing a new photo book of Motley Crue’s early years (81 and 82). Along with the shows you’ll get pictures of the things you only read about in “The Dirt”. Let me take you on a journey back to Hollywood club scene in 1981. Attend Motley Crue’s first show at the Starwood. From there, you’ll follow Motley’s progress as they perform and eventually headline all the major rock clubs in Southern California. Along the journey, I’ve included tickets from the shows, promotional material given out, along with details and stories on the venues so you feel you are part of the excitement. You won’t find any studio shoots of Motley Crue. I NEVER did a studio session with Motley (although I did do solo sessions with Tommy, Vince, and Bullwinkle on various occasions). Nikki ran Motley and he chose his photographer from London to do the studio shots for TFFL. You also won’t find any backstage shots of the band. The band members and I were broke. To take pics it cost money for film, processing and printing. Because of that, I limited my pics to just the shows. Motley performing at each of the major rock clubs on the Hollywood circuit at the time. Attend their first three shows (Starwood, Whisky, and Pookies) along with 3 other shows (Troubadour, Country Club, and Centrexx), and finally ending with their biggest show in Hollywood, the Roxy. 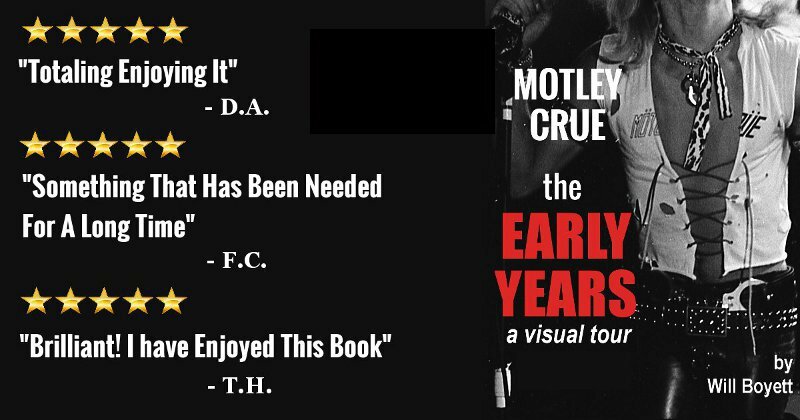 At Motley Crue’s first show, there were only two photographers there for Motley. Other photographers attended, but they were there for Y&T and may have only snapped a few photos of this unknown band. When Motley went to play at Pookies, only 12 people attended and I was the only photographer. This book is the only place you will ever see this show. Motley played at a club called Centrexx. Again, I was the only photographer there to preserve that evening on film. This book is the only place you’ll find Motley performing at this venue. This venue has since been demolished. The hardcover book is 60 pages, softcover is 50 pages. What the book lacks in quantity it makes up in rarity. The book is not a thick book, but the pages, coffee table size at 10″ x 8″, are printed on a thick glossy paper for the highest quality. Note: Other than Bonus content, both books have same pictures and stories. However, the layouts is slightly different. A small picture in one book may be larger in the other and vice versa. Reserve one of each and explore the differences yourself. I guarantee you will see and read stories you have never heard or seen before in 37 years since Motley Crue began. Order the hardcover and you’ll get a bonus section not found in the softcover. View live and studio pics of Tommy in Suite 19 and Dealer, as well as bizarre photo shoot of Lizzie Grey. The hardcover with the bonus material is being limited to only 250 copies worldwide. Each copy comes numbered and signed by myself. For softcovers ordered through CruePast (order one when you get your hardcover to save on shipping) I’ll be happy to sign each copy before shipping. It’s also possible, during the checkout process, to enter a name in case you would like to have your book personalized to a certain person. Maybe to give as a more personalized gift? The book will also come with some stories. It’s not a biography on the band, not a tell all. Instead I approach it from a different angle. 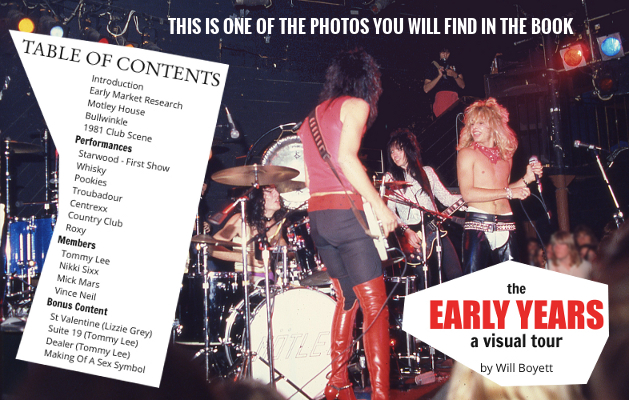 I start off describing what the 1981 club scene was like, complete with a map so you can see the distances and localities of the clubs Motley performed at on a regular basis in 81 and 82. So many have expressed their desire to be with Motley back in 1981. I hope my book gives you that. 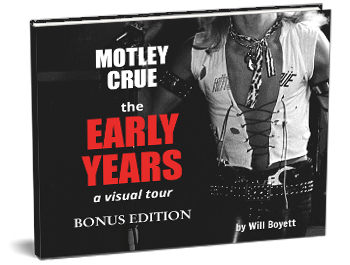 Your journey with Motley Crue along the club circuit will include pics of ticket stubs used on the evening of the shows, promotional material given out by the band at the shows. Thanks to Ryan Anderson and Motley Memorabilia for allowing me to show these rarities in this book. As we go through the photos of each of Motleys shows, I share stories about the venue, the size, the capacity, the layout. Where the after parties were usually held when Motley performed at that venue. Some photos taken from the back of the venue, some from the middle and some from the front of the stage. I tried my best to give you the experience of being in the club that evening, in the audience. Where applicable, I inject short stories about some of the pics or memorabilia found in the book. I would estimate the book is 1/3 stories and 2/3 photos. View the pics, listen to TFFL, and who knows, you may feel like you transported back to 1981, rockin with the Crue in a small club. I hope this book can do that for you. Return Policy: All books personally signed to someone can not be returned. All other books may be returned within 14 days for a refund of the purchase price of the book. Buyer pays return shipping. There is a 15% re-stocking fee. Once item has been returned in original condition, a refund will be sent.